If you don't have the energy to spend your morning painting a soothing mountain vista, using this toaster spotted over at CNET is the next best thing. 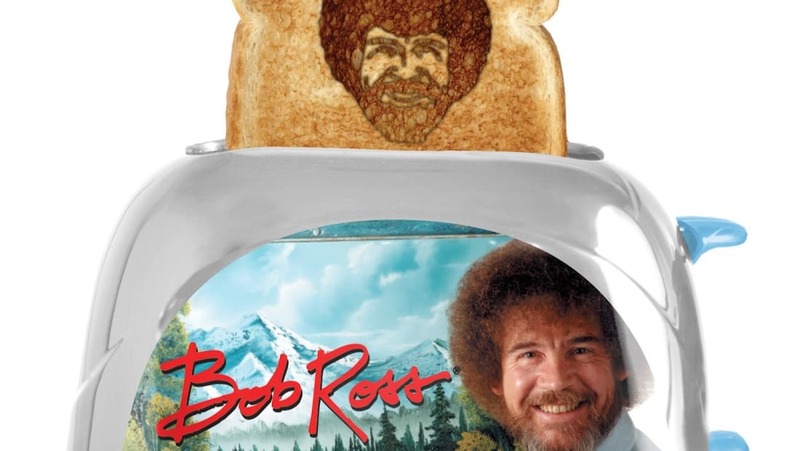 The Bob Ross toaster prints the artist's smiling face—perm and all—directly onto your bread. The Bob Ross toaster works like a regular two-slot toaster, except each piece of toast it produces comes branded with your own personal work of art. The front of the toaster itself is embellished with a picture of the painter in the middle of composing a work of art, bringing you to your happy place even before your breakfast is ready. "Celebrate the joy of breakfast with a glowing smile and a halo of seventies hair," the product description reads. "Drop bread into the slots, press the lever, and before you know it, up pops toast with Bob Ross's face and distinctive 'do." The novelty toaster is currently available to purchase online through Walmart for $40. And if this is your first piece of Bob Ross memorabilia, there are plenty of other items to add to your new collection.